The fascinating historic building of St Cuthbert dates back to the 12th Century, with many changes over the years, and demonstrates in its stone and windows, its large size and colourful ceiling the changing fortunes of the city of Wells, of which it is the historic Parish Church. The present building is thought to be the third to stand on this site, which adjoins a small mound. This probably served as a burial ground even before the coming of Christianity. The first church is believed to have been a wooden edifice built in King Alfred's time (about the end of the ninth century). It was quite natural that such a church should have been dedicated to St Cuthbert, who was an illustrious Saxon Saint. Nothing remains of this first church, nor is there anything to remind us that a second church replaced it in the Norman period. Thomas Serel, a Victorian antiquarian writing in 1875, dates the building of this second church to between 1135 and 1165. In the thirteenth century a third church was erected on the site and was the nucleus around which the present building has grown. Some parts of it still remain, notably the piers and arches of the nave arcade and a few windows, but the great restoration which took place during the fifteenth century was to all intents and purposes a rebuilding, and the great church then assumed the dimensions and general appearance that it has today, although until 1561 the church had a central tower which either collapsed or was removed. There is much in Saint Cuthbert's past of interest to those who study church history and architecture, and here are just a few features. The most striking feature of this part of the church is the sixteenth century roof. 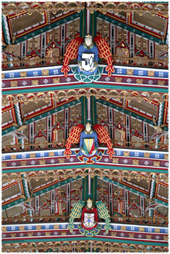 The photograph shows its carved and decorated figures of angels, rosettes and shields. The roof was restored to its present condition in 1963. In the north aisle, immediately opposite the main entrance is a room that has fulfilled many functions. Up to the Reformation it was the Treasury, where the church plate and valuables were kept. It then became an armoury where the city's arms and barrels of gunpowder were stored. The seventeenth century saw it turned into a place of detention for prisoners following the Battle of Sedgmoor, and Thomas Serel, writing in 1875, notes that within living memory it housed the City Fire Engine, and cites instances when it was taken out of the church 'for use during the time of divine service'. These contain the remnants of two fifteenth century reredos, which must have been magnificent examples of medieval craftsmanship. The one in the Lady Chapel depicted the descent of Christ from the stem of Jesse, as foretold in the Book of Isaiah, and the reclining figure of Jesse at the base is still recognisable. We know that this was commissioned in 1470 because the contract for its erection is still in existence.These reredos were mutilated by Reformers during Edward Vl's reign, who broke up the figures they contained. The brightly painted fragments were used to fill the niches in the reredos in St. Catherine's Chapel, and the whole was plastered over to give the appearance of a blank wall. They next saw the light of day, with their colours undimmed, three hundred years later during renovation work in 1848, and for a long time the fragments were stored as curiosities around the walls of one of the chapels, open to dust, fading and flaking of their paintwork. Attempts were made to catalogue the 400+ fragments in the late 20th century, and in June 2016 The Reredos Project was set up to create a comprehensive digital catalogue with detailed descriptions and photographs, and to conserve the reredos frameworks and fragments for posterity. According to the contemporary Wells Journal, a medieval painting in the St Catherine Chapel was also uncovered at the same time. This caused a great deal of controversy. The churchwarden of the time had it restored by a local painter, an action which did not meet with unqualified approval. The Wells Journal refers to the 'quaint representation, the purple robe, the badly executed halo, and the azure canopy with golden stars' and goes on to say the congregation felt that it was 'amazingly ridiculous and in bad taste', calling it 'an old fresco of no artistic merit.' The succeeding churchwarden destroyed it, although even then some commentators thought this was an 'act of vandalism unworthy of the nineteenth century.' Nothing illustrates better the way that tastes change over the centuries. Nowadays we would regard a medieval painting as a priceless treasure. The appearance of the church at the present time is due to the considerable renovation and re-ordering which took place in the Victorian era. The organ was moved from its loft in the west tower to the position it now occupies in the north aisle of the chancel; and at the same time a room used as a vestry was demolished, so that there was an uninterrupted view from the west door to the high altar. The old box pews were replaced and heating was provided for the church. 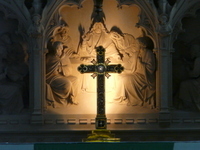 The beautiful carved stone reredos behind the High Altar, a gift of the Freemasons of the County of Somerset, was presented to the church in 1867. The most recent changes to St Cuthbert's took place several years ago, during the first phase of re-ordering. Modern, accessible facilities were installed, a new, fully-equipped kitchen built, and the Parish Office was moved and re-built to mirror the kitchen. Some pews were removed to create more space. With the dedication of the enclosed and remodelled Trinity Chapel we have now completed the second phase of re-ordering, but the basic church building remains as it always has been - at the centre of life in Wells.